In November, we asked you to contact your Congressional representative to urge passage of the PRIME Act, which would make it easier for small-scale livestock producers to sell meat to local consumers. Right now, the best chance for getting that bill passed is to include it in the Farm Bill. Lack of inspected slaughterhouses is one of the biggest barriers for small-scale livestock producers. The lack of reasonable access to a slaughterhouse keeps some farmers from selling their meat at all. For many more, the distance they must travel to the slaughterhouse means significantly increased costs, as well as stress on the animal and lost time on the farm – all of which means less supply and higher prices for consumers. Current federal law limits farmers to using either a USDA-inspected facility or a state-inspected facility that meets the USDA standards. The USDA regulations are very expensive and geared towards large-scale operations, which is why we have so few small federal or state-inspected slaughterhouses. Yet there are also many “custom” slaughterhouses, which are regulated by the States independently of USDA. These custom slaughterhouses process deer and other wildlife for human consumption. They also process cattle, sheep, goats, and pigs for human consumption. But under the current federal law, the meat from an animal processed at a custom slaughterhouse can only go to the person or persons who owned the animal when the slaughter took place. In other words, you can take your own cow to a custom slaughterhouse, or you and three other people can each share in that cow and get the meat. But if a farmer takes the cow to that exact same slaughterhouse, he can’t sell a single pound to customers on his farm or at the local farmers market. 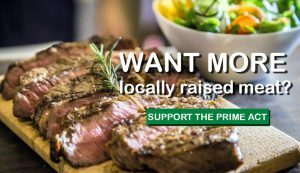 The PRIME Act would empower states to not only set their own standards for custom slaughterhouses, as they already do, but to allow the sale within their state of custom-slaughtered beef, pork, lamb, and goat to consumers, restaurants, and grocery stores. Passage of the PRIME Act would support small farmers, decrease stress on their animals, and improve consumer access to locally raised meats. Please help us pass this important bill!